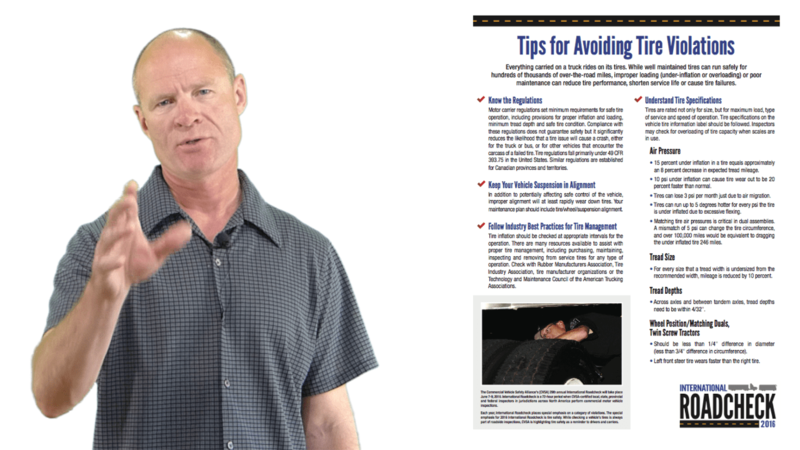 "Tips for Avoiding Tire Violations" is the handout (2016) International Roadcheck. See it interpreted here! Hi there smart drivers, Rick with Smart Drive Test talking to you today about tires and the annual safety blitz on the part of the CVSA—the Commercial Vehicle Safety Association [Alliance]—Mexico, the United States, and Canada have an annual safety blitz this year. It's happening between the 7th and 9th of June. It's a three day -seventy two-hour blitz. This year, it's focusing on tires. A few days ago I did a video on tires that got a great deal of attention, so I went on the CVSA's Facebook page and found the hand that there providing to the public and I thought I could go through that handout with you and provide a bit more information than what's on the handout just to give you some clarification of how to check your tires because that's the focus of CVSA's annual safety blitz this year. And we'll just give you a bit more information than what's on the handout. Just to make sure that if you do get pulled into the blitz, or you're out driving on that day, you won't get a fine. The handout for the CVSA‚ the Commercial Vehicle Safety Alliance‚ annual blitz this year happening between the 7th and 9th of June 2016. Don't Fail Your Pre-Trip Inspection Test…Buy the Course! A FAST course for CDL Drivers learning their pre-trip inspection. multiple choice questions that will test your understanding of terminology. You need three millimeters of tread or one-eighth of an inch on front steer tires. You also need one sixteenth of an inch on rear tires or 1.6 millimeters. That is the requirements for tread depth on the tires. Now I'll get into it a little bit later, because down in points here, farther you, have to have the tread depth also matching across the axle and between the sets of duals on the back of your tractor or bus. As you can see here on the handout, keep your vehicle suspension in alignment is not really the part of the driver, that is a maintenance policy on the part of the company, unless you're an owner operator and have your own truck. Vehicle or vehicle wheel alignment is the policy of the maintenance shop and they're going to do that. Your job is to notice irregular wear and point out and fill out the appropriate maintenance documents. This is essentially maintaining the inflation of the tires. You might want to get a tire gauge and just check the tires on your vehicle. Most big trucks need to be greased every couple of weeks. During the greasing it takes about 10 minutes to go around and check the tire pressure on all the tires. The maintenance personnel, or whoever does that to your truck or you do it yourself - it takes about 10 minutes. Some of the tires may need some air pressure or whatnot. They do say in the handout, that most these tires—just by sitting or being used—will lose about three pounds every month just from sitting. Again this is not really the responsibility of the driver. This is the responsibility of the tire shop, the maintenance shop, or the people who purchase the tires for your trucks and units. 22.5s & 24s are the most common on road tractors. 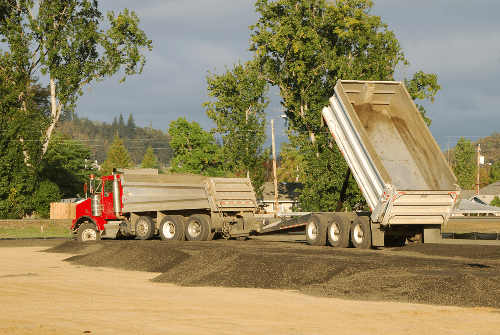 There may be some other different types of tires depending on what the use of the truck is - gravel trucks, cement trucks, those types of things will have different kinds of tires. What you need to know, as the driver, is that you are in compliance with the axle weights of that vehicle. In the United States it's 12,000 pounds on the steer axles, 34,000 on tandem-tandem. Most of the States in the United States run tandem-tandem and that's all they're allowed. Michigan and a couple other states have other weight allowances and if you're running multi axle trailers in Michigan and other States you're going to know what the weights are or ask your dispatcher, or ask safety to look that up for you so you know what the weight rating is. In Canada, steer axles are 5,500 kilograms, tandem axles are 17,000 kilograms, and triple axles are 23,000 kilograms in every province except British Columbia, which allows you 24,000 kilograms. You need to know that you're in the weight specifications. If you have any questions or any doubts about the tire specifications and they're going to hold up that amount of weight then you need to question the safety department, the maintenance shop, and those types of people. Those questions need to go to other people in the trucking company. There isn't much that it says on here about air pressure other than running tires on low air pressure is gonna increase the heat, it's decreased the wear and tear & the life of the tire. So air pressure - know that they need to be above a hundred pounds per square inch - most of the time there between 100 and 110 pounds per square inch. I did not understand this! It says: "for every size that a tread width is undersized from the recommended width, mileage is reduced by 10%." I did leave a comment on the CVSA's Facebook page and I'll put a link down in the comment there. They didn't get back to me and I don't think that they probably will!?! I just get a suspicion that they're not gonna get back to me on that point. I didn't understand it and because it's just a statistic, I don't think it's relevant to anything that drivers would need to know in terms of the annual safety blitz. Tread depth must match across the axle, side to side and the duels on the back of the truck within 4/32 seconds of an inch as it says on the handout. one-eighth of an inch - nobody reduced down 4/32 seconds of an inch. One-eighth of an inch or three millimeters for those of you in Canada and using the metric system. So across the axle, tire-to-tire must match within 1/8 of an inch on tread depth and across the four duals on the tandem tandem or triple axels if you're in Canada. What they're looking here for is tire size. The tire size on tandem axles in duels must match within a quarter of an inch on the diameter. So the diameter of the tire and the rim - they're measuring from the center of the hub to the top of the tire and this has to match within a quarter of an inch. Or they're going to measure the circumference of the tire and it has to be three quarters of an inch - It has to match within three-quarters of an inch. They probably take the tire size or measure the diameter and from the diameter there's a formula that they can figure out the circumference. So it a quarter inch on diameter, three-quarters of an inch in circumference and that is something very specific that really drivers don't need to worry about. You can look at a tire and know whether it's going to match or not. They have to be the same size. Often times they have to be the same make as well in order for them to match. So those of the subheadings on the handout for the CVSA. 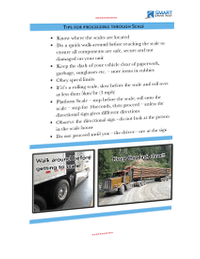 So that gives you some further information on the CVSA handout provided for the annual safety blitz that's happening between June 7 and 9, 2016. • CDL Drivers are the only sector that has its own police force. • There is a lot of paperwork you must produce at the weigh scale. • Bring all paperwork in one hit & impress the diesel bears! 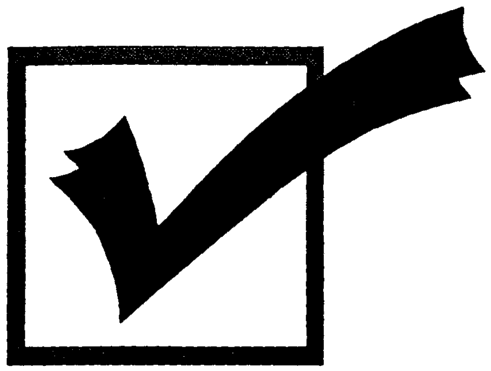 don't get fined :: GET YOUR CHECKLIST!! For new drivers and those that haven't been pulled into weigh scale before, the paperwork that you need to take into authorities is extensive. It's ownership for the truck, and the trailer, your license, your logbook, pre-trip inspection form, bills of lading, MVI reports (Motor-Vehicle Inspection), and pre-trip reports. For new drivers, it can be somewhat overwhelming. It will give you all the paperwork that you need to take into authorities. And if you take the paperwork in in one hit it makes you look organized. If you look organized, it raises less suspicions on the part of the authorities because if your paperwork is organized probably your trucks organized as well. That's the thinking in their minds. Remember so much of life is about cosmetics! CLICK HERE TO GET YOURS! Don’t miss any great driving information and all the astonishing offers we bring you. We never spam!